During a trip to New York in 1999, I bought my now-cherished copy of the Christie’s catalogue, The Personal Property of Marilyn Monroe, a monumental tome that gave unusually intimate insight into the actress’s life, as told through the story of her personal possessions. Alongside annotated film scripts, Ferragamo stilettos and ever-immortalised sequined frocks, one of the most intriguing aspects of the sale was the actress’s extensive collection of one particular designer – her wardrobe of choice when she was not, so to speak, being “Marilyn.” The designer was none other than Emilio Pucci, whose silk jersey shift dresses, which hinted at the coming sexual revolution, the actress collected in multiple, sherbet-like hues. If Monroe was the quintessential, modern woman before her time then Pucci was the designer for the modern woman, granting her unprecedented freedom of movement in his pioneering of luxurious, almost weightless stretch fabrics. Born into one of Florence’s oldest noble families in 1914, the Marchese Emilio Pucci di Barsento became known as the ‘Prince of Prints’, a play on his aristocratic heritage as well as his signature, swirling patterns that captured, and even informed, the psychedelic spirit of the 1960’s. 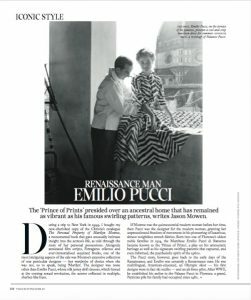 The Pucci story, however, goes back to the early days of the Renaissance and Emilio was certainly a Renaissance man. He was multilingual, American educated, an Olympic skier – his first designs were in fact ski outfits – and an air force pilot. After the war, he established his atelier in the Palazzo Pucci in Florence, a grand, Patrician pile his family had occupied since 1480. As Florence flourished over the centuries, so too did the Pucci. They made their fortune in trade and were close allies of the Medici throughout the 15th Century; rose to further prominence, producing three cardinals, in the 16th Century; and acquired the fiefdom of Barsento in the 17th Century. They were also great patrons of the arts, although it was a gift from Lorenzo de Medici to Giannozzo Pucci in 1483 that’s of particular note – a series of four magnificent panels, The Story of Nastagio Degli Onesti by Sandro Botticelli, one of which still graces a wall in the palazzo. In keeping with the Florentine architectural tradition, Palazzo Pucci’s exterior is ruggedly handsome rather than beautiful, like many of its Roman counterparts – a difference surely noted by the current mistress, the Marchesa Cristina Pucci di Barsento, who hailed from the Italian capital prior to her marriage to Emilio in 1959. Following six centuries of renovations and additions, as well as subtle ‘refreshments’ made by the marchesa, the interior is softer and more nuanced. 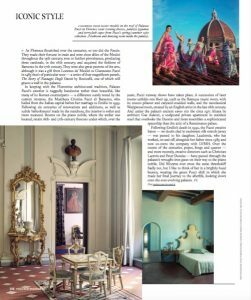 Rooms on the piano nobile, where the atelier is located, retain 16th and 17th Century frescoes under which, over the years, Pucci runway shows have taken place. A succession of later rooms unfold one floor up, such as the c.1690 Baroque music room, with its stucco pilaster and caryatid-clad walls, and the neoclassical Wedgewood room, created by an English artist in the late 18th Century. And under the palace’s ancient eaves sits the c.1971 Altana by architect, Gae Aulenti, a sculptural private apartment in stainless steel that overlooks the Duomo and more resembles a sophisticated spaceship than the attic of a Renaissance palace. Following Emilio’s death in 1992, the Pucci creative batton, no doubt clad in exuberant, silk stretch jersey, was passed to his daughter, Laudomia, who has worked, on and off, alongside her father since 1985 and now co-owns the company with LVMH. 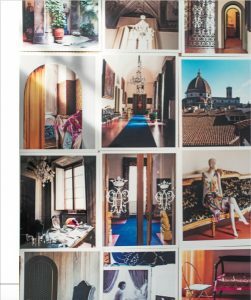 Over the course of the centuries, popes, kings and queens – and more recently, creative directors such as Christian Lacroix and Matthew Williamson – have passed through the palazzo’s wrought-iron gates on their way to the piano nobile. Did Monroe ever cross the same threshold? Sadly not, but I like to think of her in a brightly hued heaven, wearing the green Pucci shift in which she made her final journey to the afterlife, looking down onto the ever evolving palazzo.